The heart and lungs work closely to meet the tissues’ oxygen demands. If the balance between oxygen demand and supply becomes disturbed in critical illness, tissue hypoxia and cell death can rapidly result. An essential part of critical care is to maintain cardiopulmonary function with the help of pharmacotherapy, fluid management, and respiratory support. Paradoxically, interventions aimed at improving the function of one system can sometimes have undesirable effects on the other and, although the pulmonary consequences of cardiac disease are well recognised, the influences of changes in pulmonary physiology on cardiac function are less well appreciated. Cardiopulmonary interactions are present in health, and can be exaggerated or abnormal in the presence of disease. This article will provide an overview of this broad topic. By emphasising the underlying physiological principles and the influence of disease states upon these, we hope that respiratory support will then be tailored to the individual patient. Spontaneous and mechanical ventilation induce changes in intrapleural or intrathoracic pressure and lung volume, which can independently affect the key determinants of cardiovascular performance: atrial filling or preload; the impedance to ventricular emptying or afterload; heart rate and myocardial contractility. Changes in intrathoracic pressure are transmitted to the intrathoracic structures: namely the heart and pericardium, and the great arteries and veins. Spontaneous inspiration produces a negative pleural pressure, and the reduction in intrathoracic pressure is transmitted to the right atrium. In contrast, intermittent positive pressure ventilation (IPPV) produces inspiratory increases in intrathoracic pressure and therefore right atrial pressure (PRA), and if a positive end expiratory pressure (PEEP) is added, these pressures remain greater than atmospheric pressure throughout the respiratory cycle. Furthermore, changes in intrathoracic pressure and lung volume can have additional important effects in patients with interstitial or vascular pulmonary pathology, or congenital heart disease, all of which are quite frequently encountered in the paediatric population. The Valsalva effect, the physiological response to a sustained increase in airway pressure against a closed glottis, is characterised by an early increase in arterial pressure and a fall in cardiac output secondary to reduced venous return. Although not an accurate physiological “model” of PPV, the Valsalva effect clearly demonstrates important influences of an increased intrathoracic pressure on the right heart. One of the first and most important physiological studies of the effects of PPV on cardiac function was by Cournand’s group, who in the late 1940s demonstrated a variable reduction in cardiac output in healthy volunteers receiving “mask” PPV.3 4 Cournand showed that right ventricular (RV) filling was inversely related to intrathoracic pressure, and as this became more positive so the RV preload fell, producing a detectable fall in cardiac output. Model of the circulation, showing factors that influence systemic venous drainage. The right heart (RH) and intrathoracic great veins are subjected to pleural pressure (Ppl), which varies throughout the respiratory cycle. Intra-abdominal pressure increases with inspiratory diaphragmatic descent, and normalises to atmospheric (Patmos) with expiration. Peripheral venous pressure is unaffected by respiration and so remains at atmospheric pressure throughout the respiratory cycle. Systemic venous drainage (broken arrow) depends on a driving pressure gradient between extrathoracic great veins (EGV) and the right atrium, and so during spontaneous respiration is maximised during inspiration as the pleural (and right atrial) pressure falls, and the intra-abdominal (and therefore EGV) pressure rises. Clearly, there are certain clinical situations where the effect of a positive intrathoracic pressure may cause major compromise secondary to cardiac output by impeding venous return. These include hypovolaemia, septic shock, gas trapping associated with obstructive airways disease, and obstructive right heart lesions with venous to pulmonary shunts. In these situations we frequently compensate by using volume loading of the right heart to augment venous return,11 12 cautious use of α adrenergic agonists or inotropic drugs, and by mitigating the effects of a positive intrathoracic pressure by ventilatory strategies recommended by Cournand 50 years ago. To understand the complex effects of changes in intrathoracic pressure on the left ventricle (LV), it is necessary to understand the concept of transmural pressures (the difference between the pressure within a chamber or vessel and the pressure around it). When we invasively monitor pressure in a peripheral artery, we measure the intravascular pressure relative to atmospheric. However, the thoracic aorta, being within the thorax, is subjected to changes in pleural pressure rather than atmospheric. The transmural pressure (Ptm) of the aorta is therefore the difference between the pressure within the vessel and the pleural pressure (Ppl). Pulmonary vascular resistance (PVR) is the main determinant of RV afterload and is directly affected by changes in lung volume.20 The total resistance of the pulmonary circulation depends on the balance in the vascular tone of its two components: the alveolar vessels, and the extra-alveolar or parenchymal vessels. PVR can become raised at both extremes of lung volume (fig2).21 When the lung is inflated above functional residual capacity (FRC), alveolar vessels become compressed as a result of alveolar distension. As lung volume falls from FRC towards residual volume two events can occur, and both can independently increase the PVR. First, the extra-alveolar vessels become increasingly tortuous and tend to collapse. Second, and perhaps more importantly, terminal airway collapse at low lung volumes can cause alveolar hypoxia and, at an oxygen tension of below 60 mm Hg, this results in hypoxic pulmonary vasoconstriction. 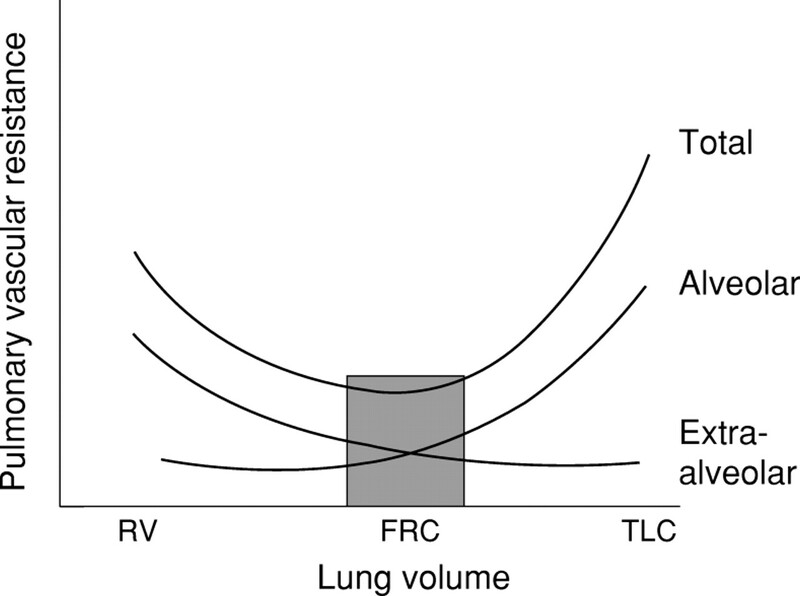 Schematic representation of the relation between lung volume and the pulmonary vascular resistance (PVR). As lung volume increases from residual volume (RV) to total lung capacity (TLC), the alveolar vessels become increasingly compressed by the distending alveoli, and so their resistance increases, whereas the resistance of the extra-alveolar vessels (which become less tortuous as lung volume increases) falls. The combined effect of increasing lung volume on the pulmonary vasculature produces the typical “U shaped” curve as shown, with its nadir, or optimum, at around normal functional residual capacity (FRC). If the healthy cardiopulmonary system is ventilated near “normal” FRC without excessive shifts in lung volume, it is unusual to see clinically important changes in RV afterload with a PEEP of less than 10 cm H2O. However, the situation can be very different in patients who have hyperinflated lungs secondary to asthma or obstructive pulmonary disease; and in children with pre-existing pulmonary hypertension. For the reasons described above, apparently small changes in lung volume can cause considerable haemodynamic compromise secondary to acute elevation of PVR in these patients, and particular care should be taken to avoid additional gas trapping, or large shifts in lung volume during mechanical ventilation. As well as being independently affected by the pressure and volume changes that occur during ventilation, the effect of filling one ventricle can directly influence the function of the other. A number of studies have shown that the increase in RV volume during spontaneous inspiration leads to a reduction in LV compliance, and hence LV filling.22 There are two mechanisms for this: first, RV filling causes leftward shift of the interventricular septum, and this impedes diastolic LV filling.11 23 Second, the inspiratory increase in RV volume causes the pericardial pressure to rise,6 and this increase in pressure is then transmitted to the LV, and in turn impedes pulmonary venous return. There is good evidence to suggest that ventricular interdependence is a major cause of pulsus paradoxus in patients with a restrictive pericardium as a result of tamponade or constriction. This effect becomes more exaggerated as the pleural pressure is made more negative, or with a fluid bolus that acutely fills the RV. Conversely, the application of PEEP can be beneficial to these patients. The autonomic responses to changes in lung volume during tidal ventilation result in sinus arrhythmia, where spontaneous inspiration increases the heart rate by withdrawal of vagal stimulation, and the reverse happens during expiration. If the lungs are hyperinflated, or excessive tidal volumes are applied, then vagal overstimulation leads to a reduction in heart rate, and reflex arteriolar dilatation.13 Smaller infants in whom respiratory rate and resting sympathetic tone are high can be particularly sensitive to vagal overstimulation when PPV is initiated. As lung volume increases, the lungs push against the heart, the chest wall, and diaphragm. While the chest wall expands outwards and the diaphragm descends, the heart and pericardium, and even the coronary arteries, become compressed by the lungs.24 At extremes of lung volume, or in patients with hyperinflated lungs, ventricular filling can be so compromised as to produce the clinical picture of tamponade. These effects can usually be avoided by use of conservative tidal volumes, with particular caution in patients with hyperinflated lungs. On the intensive care unit, we can apply many of the physiological principles that have been described to limit detrimental cardiopulmonary interactions and enhance those that are beneficial, depending on the clinical situation. An acute reduction in systemic venous return during the initiation of PPV is one of the most commonly observed heart–lung interactions on the intensive care unit. Moreover, this is the most likely cause of “acute cardiovascular collapse” seen after intubation. In small infants, the inflation vasodilatation response due to vagal overstimulation can further aggravate this. The onset of PPV can unmask a patient’s volume status, and this can be particularly dramatic in hypovolaemic patients and in those who are vasodilated with systemic sepsis. In children, we rarely have the luxury of intravascular catheters to give us accurate measurements of right or left atrial pressure, but anticipatory management can help prevent cardiovascular compromise at the onset of ventilation. A fluid bolus can partially offset the reduction in venous return that can accompany PPV, especially if high levels of PEEP are anticipated. Careful selection of anaesthetic agents, and avoidance of those that cause vasodilatation or negative inotropy, can also help maintain stability. Positive inotropes can also be very useful adjuncts in patients with impaired myocardial function, and systemic vasoconstrictors can attenuate cardiovascular depression in vasodilated patients. The advance administration of an anticholinergic agent can also help attenuate the “vagal” responses to intubation and ventilation, which are exaggerated in smaller infants. The effects on venous return of sustained increases in intrathoracic pressure during PPV can be limited by applying the strategies described by Cournand. Moreover, if the patient’s clinical status allows, a method of ventilation that allows patient initiated breaths, such as intermittent mandatory ventilation, pressure support ventilation, or continuous positive airway pressure (CPAP), will result in a lower intrathoracic pressure than if all breaths are ventilator derived. Left ventricular failure and pulmonary oedema are associated with an increased intrathoracic blood volume. By limiting venous return and lowering LV afterload, a positive intrathoracic pressure, or often simply the use of PEEP can improve the cardiac output of these patients. PEEP also helps to maintain alveolar patency and therefore lung volume in these patients who are at great risk of secondary atelectasis as a result of oedema, and so improvements in oxygenation and in lung volume towards FRC can also have a beneficial effect on RV afterload. Thus, an increase in intrathoracic pressure can improve cardiac output in patients with LV dysfunction. The use of non-invasive PPV is becoming increasingly popular as combined cardiorespiratory treatment for patients with ventricular dysfunction. If tolerated, mask or nasal prong CPAP or bilevel positive airway pressure (BiPAP) reduce the work of breathing while benefiting LV function, and have the added advantage of avoiding endotracheal tube related problems, such as the need for sedation and the high risk of pulmonary infections. Patients with airflow limitation secondary to increased airway resistance (acute bronchospasm), or reduced elastic recoil (interstitial emphysema), are at particular risk of developing auto-PEEP. Cardiac output becomes compromised as a result of sustained increases in lung volume on the cardiac fossa and on PVR, and of course from the effects of an increased intrathoracic pressure on venous return. Ventilatory settings should be carefully adjusted to avoid further air trapping, using a long expiratory time; and although extrinsic PEEP will lessen the work of breathing, it should be applied cautiously to avoid further cardiovascular deterioration. Adjunctive treatment should be aimed at improving the intrinsic lung mechanics with secretion clearance, bronchodilator treatment, and so on. Pulmonary oedema precipitated by an acute and dramatic fall in intrathoracic pressure has been reported in between 9% and 12% of children and adults with acute upper airway obstruction, and commoner causes of this are croup and other upper airway infections, foreign body aspiration, and postextubation laryngospasm. As intrathoracic pressure falls well below zero (which is inevitable in this situation), the intrathoracic great veins collapse, thus any beneficial effects on RV preload are transient. The excessively negative intrathoracic pressure can increase LV afterload sufficiently to cause pulmonary oedema, and this can be further exacerbated by an increased pulmonary capillary pressure resulting from pulmonary vasoconstriction secondary to hypoxia and hypercapnia. Acute management is aimed at correcting hypoxaemia, and controlling the intrathoracic pressure with mechanical ventilation. The approach to the ventilation of patients with congenital heart disease can play a key role in their haemodynamic management. There are a number of important groups to consider. Neonates in whom the systemic circulation is wholly dependent on a persistent ductus arteriosus—for example, babies with a hypoplastic left heart or variants of this—are highly susceptible to the sequelae of systemic hypoperfusion, such as cerebral ischaemia and necrotising enterocolitis. We often electively intubate and ventilate these babies to afford better control of their PVR, and so optimise the balance between pulmonary and systemic flow.29 Ventilatory management should be aimed at avoiding factors that lower the PVR, such as over-oxygenation and alkalosis. Thus, we usually maintain a mild respiratory acidosis, and in most cases we avoid the use of additional inspired oxygen (we ventilate in air). Left to right shunts with increased pulmonary blood flow are commonly seen in babies and children with septal defects (atrial, ventricular, or atrioventricular), or a persistent ductus arteriosus (PDA). In the early neonatal period, the raised PVR partially protects the pulmonary vascular bed from excessive flow, and so neonates with large lesions can initially be relatively asymptomatic. However the PVR spontaneously falls at 4 to 6 weeks of age, thus increasing the flow into an unprotected pulmonary bed. Depending on the degree of the shunt, myocardial function, and general status of the child, this can produce symptoms of heart failure: tachypnoea, failure to thrive, and recurrent chest infections. Positive pressure ventilation plays an important role in the haemodynamic treatment of patients with a large shunt secondary to excessive pulmonary blood flow. Some patients require mechanical ventilation purely because of uncontrollable symptomatic cardiac failure; others, such as premature neonates with a PDA, might already be ventilated for a combination of reasons. In all cases, ventilatory strategies should be directed at avoiding factors that increase pulmonary blood flow, such as hyperventilation and excessive oxygen administration. A slightly raised CO2 may be beneficial and, in many patients, saturations might best be maintained at around 90%, thereby providing adequate tissue oxygenation while protecting pulmonary flow. PEEP also plays an important role in these patients: a reduction in LV afterload and venous return may be desirable in patients with a large shunt, especially in the presence of reduced myocardial function. Finally, a modest elevation of PVR with PEEP may limit pulmonary blood flow, producing an additional beneficial effect. Cardiopulmonary bypass leads to diffuse endothelial damage with increased vascular permeability, and this inevitably leads to a degree of pulmonary and myocardial injury that fortunately is usually reversible.30 31 Although not always clinically apparent, alveolar, interstitial, and chest wall oedema can reduce lung compliance; so necessitating higher inspiratory pressures and PEEP to deliver adequate tidal volumes. These ventilatory strategies should be applied with care because cardiovascular instability can be easily precipitated in the early post-bypass patient, and “compensatory” fluid boluses can be poorly tolerated in patients with borderline myocardial function and a high systemic vascular resistance. Certain patients with congenital heart disease are particularly susceptible to the hazardous effects of PPV, and these will be discussed below. The Fontan operation was first introduced as a surgical procedure to separate the systemic and pulmonary circulations in patients with tricuspid atresia.32 Since its introduction, the Fontan operation and its modifications have been widely used as surgical palliation for a variety of complex congenital cardiac lesions, which in essence share a common feature: an absent or inadequate subpulmonary chamber. The surgical approaches can be divided broadly into those that anastomose the right atrium to the pulmonary artery (atriopulmonary connection), and those that directly join the superior and inferior venae cavae to the pulmonary artery (total cavopulmonary connection). Patients with the Fontan circulation have unique cardiopulmonary physiology: in the absence of a right ventricle, pulmonary blood flow, the major determinant of cardiac output, is a passive diastolic phenomenon, which is exquisitely sensitive to changes in intrathoracic pressure. It is enhanced as the pleural pressure becomes negative during spontaneous inspiration, but reduced or even zero when the intrathoracic pressure is made more positive.33 For this reason, when ventilating these patients, conservative settings should be used, with short inspiratory times, low inspiratory pressures, and minimal PEEP, and haemodynamic management should include early extubation where possible. It is easy to underestimate the effects of ventilation on the cardiovascular system, or to misinterpret cardiopulmonary interactions as primary cardiovascular events. We have described how simple ventilatory interventions can sometimes be used to obviate the unnecessary escalation of pharmacological support, and have discussed how in other situations, anticipatory management with fluids or vasoactive agents can minimise cardiovascular compromise during mechanical ventilation. Mechanical ventilation plays a crucial role in the haemodynamic management of critically ill children, and application of the principles that have been described are an essential part of intensive care management. (1941) Statical essays: containing haemostatics. in Cardiac classics. eds Willius FA, Keys TE (Mosby, St Louis), pp 133–137. (1981) Effects of spontaneous ventilation on the circulation [review]. Lung 159:175–186. (1948) Intermittent positive pressure breathing. A means of administering artificial respiration in man. JAMA 137:370–382. (1948) Physiological studies of the effects of intermittent positive pressure breathing on cardiac output in man. Am J Physiol 152:162–174. (1957) Venous return at various right atrial pressures and the normal venous return curve. Am J Physiol 189:609–615. (1987) Hemodynamic effects of external continuous negative pressure ventilation compared with those of continuous positive pressure ventilation in dogs with acute lung injury. Am Rev Respir Dis 136:886–891. (1992) Hemodynamic differences between continual positive and two types of negative pressure ventilation. Am Rev Respir Dis 146:677–680. (1997) Cardiopulmonary interactions in healthy children and children after surgery for simple cardiac defects: a comparison of positive and negative pressure ventilation. Heart 78:587–593. 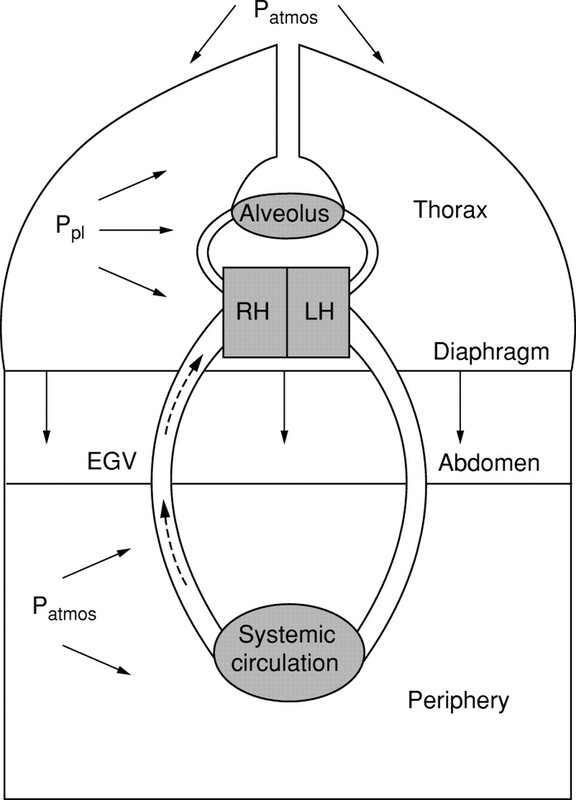 (1984) Determinants of pulmonary arterial flow variation during respiration. J Appl Physiol 56:1237–1245. (1981) Influence of positive end-expiratory pressure on left ventricular performance. N Engl J Med 304:387–392. (1977) Influence of abdominal pressure and sympathetic vasoconstriction on the cardiovascular response to positive end-expiratory pressure. Am Rev Respir Dis 116:661–670. (1981) The lungs as receptor sites for cardiovascular regulation. Circulation 63:1–10. (1989) Noncardiogenic pulmonary oedema following laser treatment of a tracheal neoplasm. Chest 96:1430–1431. (1979) Cardiac effects of increased lung volume and decreased pleural pressure in man. J Appl Physiol 47:257–262. (1989) Negative intrathoracic pressure decreases independently left ventricular filling and emptying. Am J Physiol 257:H120–H131. (1973) Hemodynamic response to discontinuance of mechanical ventilation. Crit Care Med 1:85–90. (1981) Positive end-expiratory pressure (PEEP) does not depress left ventricular function in patients with pulmonary oedema. Am Rev Respir Dis 125:121–128. (1982) Effect of lung inflation on pulmonary vascular resistance by venous and arterial occlusion. J Appl Physiol 53:1110–1115. (1960) Influence of the state of the lung on pulmonary vascular resistance. J Appl Physiol 15:878–882. (1971) Effects of chronic right ventricular volume and pressure loading on left ventricular performance. Circulation 44:403–412. (1980) Leftward septal displacement during right ventricular loading in man. Circulation 61:626–633. (1982) Mechanical cardiopulmonary interdependence. J Appl Physiol 52:333–339. (1997) Randomized, multicenter trial of inhaled nitric oxide and high-frequency oscillatory ventilation in severe, persistent pulmonary hypertension of the newborn. J Pediatr 131:55–62. (1998) Inhaled nitric oxide and high frequency oscillatory ventilation in persistent pulmonary hypertension of the newborn [review]. Eur J Pediatr 155 (suppl 1) S28–S30. (1998) The use of inhaled nitric oxide in a wide variety of clinical problems [review]. Pediatr Clin North Am 45:531–548. (1998) The effects of inhaled nitric oxide on postoperative pulmonary hypertension in infants and children undergoing surgical repair of congenital heart disease. Anesth Analg 87:46–51. (1996) Fetal model of single ventricle physiology: hemodynmaic effects of oxygen, nitric oxide, carbon dioxide, and hypoxia in the early postnatal period. J Thorac Cardiovasc Surg 112:437–449. (1984) Measurement of extravascular lung water in infants and children after cardiac surgery. Am J Cardiol 54:161–165. (1992) Pulmonary mechanics in infants after cardiac surgery. Crit Care Med 20:22–27. (1991) Doppler echocardiographic evaluation of pulmonary blood flow after the Fontan operation: the role of the lungs. Br Heart J 66:372–374. (1996) Negative pressure ventilation improves cardiac output after right heart surgery. Circulation 94 (suppl II) 49–55. (1997) Cardiopulmonary interactions after Fontan operations: augmentation of cardiac output using negative pressure ventilation. Circulation 96:3934–3942.